Our discussions with people who know about water, people and floods in the New Orleans region produced one regular refrain: Building a levee may be the most obvious defense against high water, but it's no cure-all. Sooner or later, levees fail. That's why you need defense in depth. Sometimes, desperate efforts can plug levee breaks during a flood. 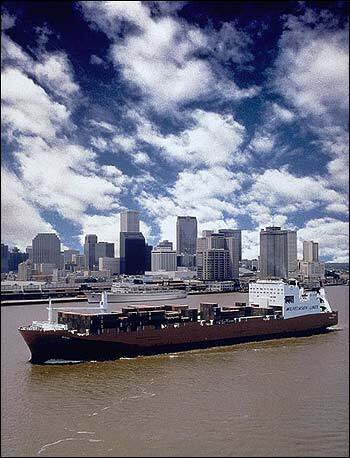 Photo: "The Mississippi River Flood Problem," by John A. Fox, 1915, NOAA. The loss of the levees has left portions of New Orleans with little or no protection midway through the hurricane season, senior Army officials said. And rebuilding the levees will be a massive undertaking that could take years, meaning the city could be vulnerable for a long time. "It is gone," said Col. Richard Wagenaar, the Army Corps' [of Engineers] head engineer for the New Orleans district. "It is literally leveled in places. The power of the surge in this storm was greatly underestimated." Wagenaar estimated that 90 percent of the levee system protecting the region's eastern flank had been knocked out. It's likely that the levees protecting New Orleans will be repaired and many will be raised, but is that enough? Perhaps not; after all, the city and the rest of the Mississippi delta are sinking. Many observers, from hardened civil engineers to the greenest environmentalist, told us that New Orleans needs to regain the protection it used to have from coastal wetlands and barrier islands, which have been disappearing at a rate of 34 square miles a year. Hurricanes get their energy from warm water. As they move onto land, they immediately weaken. 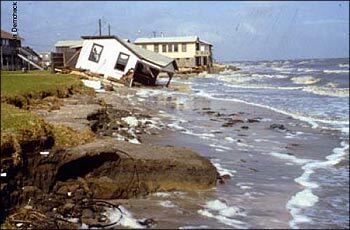 Through friction, land reduces the storm surge and wind speed. When a storm surge passes across 2.7 miles of wetland, it loses 1 foot of height, according to a 1961 report from the U.S. Army (see "Mississippi River Delta..." in the bibliography, or No Time to Lose). With Louisiana losing so much wetland every year, the New Orleans region is becoming more vulnerable to hurricanes. Although gulf wetlands are also good animal and plant habitat, supply a good portion of the U.S. fish and shellfish harvest, protect freshwater aquifers, and are a natural cleaner for river water, we're going to concentrate on their benefits for dampening storms and protecting against floods -- without claiming they can do those jobs all by themselves. Once upon a time, the entire delta region was fed by the Mississippi River, which carried a huge load of silt and sediment down from a watershed occupying about 40 percent of the lower 48 states. When one part of the delta rose under the accumulating sediment deposits, the river shifted to another channel, only to repeat the process. Over thousands of years, this process produced the river's rich, flat and marshy delta -- an ever-changing terrain founded on a base that is steadily sinking. Then came the builders. 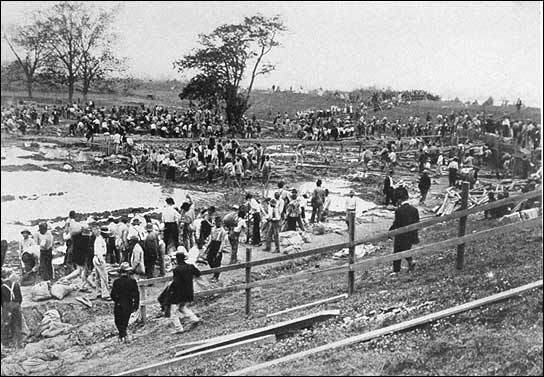 For a hundred reasons, related to housing, commerce, and the simple preference for dry feet, the European settlers started building levees in the 1700s, and they never stopped. They froze the Mississippi River in place. Out in the Gulf of Mexico, artificial jetties surrounded the river, stretching dozens of miles into the Gulf so ocean-going ships can reach New Orleans, which became the nation's fifth-largest port in terms of cargo. The rapid wetland destruction has many causes. Some, as we'll see, are found in the vast network of river engineering projects throughout the Mississippi and its many tributaries. But others are local. Take the canals that the oil industry has cut for boats, barges, and pipelines. These canals are a major source of erosion and salt water intrusion into the delta wetlands, according to Nicholas Pinter, a professor of geology at Southern Illinois University. In protecting the vital wetlands, he says, "The first step is to stop the destruction, to stop cutting canals." 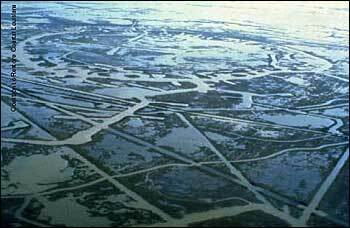 As salt water intrudes from the gulf, less fresh water enters the wetlands from the Mississippi, channeled as it is inside levees and jetties. As a result, salt water is killing fresh-water wetland plants, contributing to further erosion. 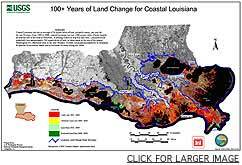 The constrained Mississippi can no longer deposit sediment on the sinking delta, and as the wetlands sink beneath the shallow Gulf waters, more of the coast is exposed to storms and erosion. As the coast erodes, so does the unique lifestyle of South Louisiana. 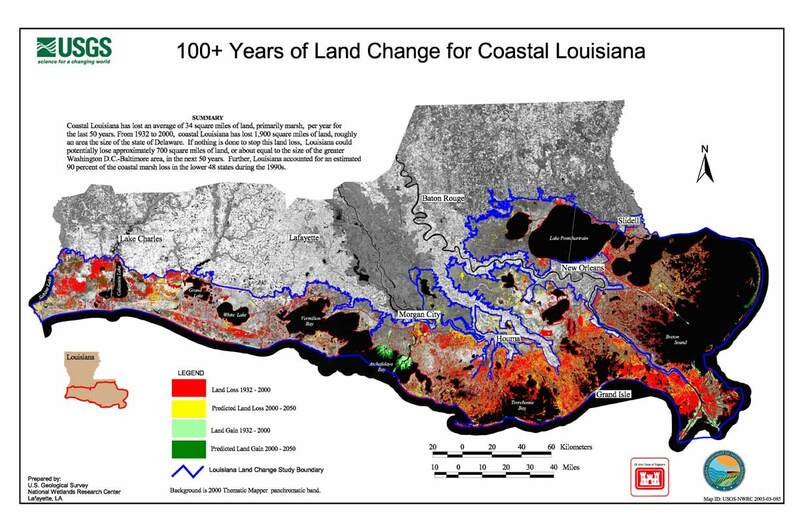 Canals cut by the oil and gas industry have contributed to the erosion of coastal wetlands in Louisiana. These problems are no secret to people who love and study the intricate river-marsh ecosystem of coastal Louisiana, and for decades, they have urged the release of more sediment-rich fresh water into the wetlands. Although the many wetland protection and restoration projects that have been started are usually justified as mechanisms for habitat restoration and coastal protection, not for dampening storms, they could offer both benefits. In 1991, the Caernarvon diversion structure began releasing Mississippi River water into the wetlands, to improve wildlife and marine habitat. A second diversion, the Davis Pond Freshwater Diversion Structure, was built to feed river water into wetlands south of New Orleans. The diversions are opened during normal river flow, not during floods, so fresh water and sediment can pass over the wetlands and down to the coast. The diversions are an engineering measure intended to reverse previous engineering measures, to do "what the river would have done if the levees were not there," says river-engineering veteran Gerald Galloway. Further down the river, where it is channeled out into the Gulf of Mexico, you can get a similar effect by simply punching holes -- "crevasses" -- in the jetties. Mark Boyer, who studied these crevasses while at Louisiana State University in the 1990s, says the surrounding areas "used to be all wetland, but because of subsidence and sea-level rise, is now shallow open water." The crevasses route sediment-laden water into shallow bays between the river branches, where it "actually builds wetlands, creates wetland where there was open water, and the amazing thing is that this stuff happens, creates land, for less $300 per hectare," says Boyer, who is now in the department of landscape architecture at the University of Arkansas. 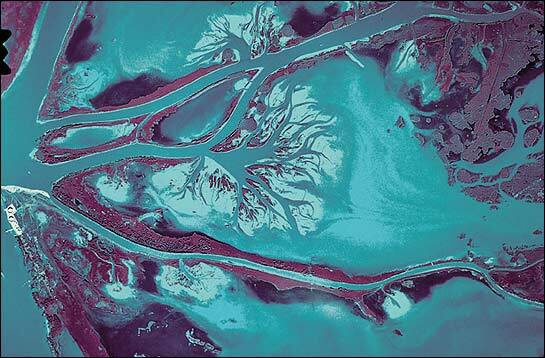 Dams on the Mississippi and its tributaries trap huge amounts of sediment upstream. Should we do something about that?